This relaxed holiday town is nestled on the cliffs of the Murray and features two bridges spanning the majestic waterway. Blanchetown is made up of river shacks and uncrowded stretches of calm water ideal for activities all year round, on or off the water. This relaxed holiday town is nestled on the cliffs of the Murray and features two bridges spanning the majestic waterway. Blanchetown is made up of river shacks and uncrowded stretches of calm water ideal for activities all year round, on or off the water. Learn about Blanchetown’s involvement in the lock and weir system or visit Brookfield Conservation Park, a breeding ground for the Southern Hairy-nosed wombats that graze on the western side of the river. 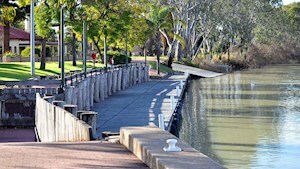 At the end of the day, drop into the Blanchetown Hotel for a drink on the deck overlooking Lock 1, on the Murray River. 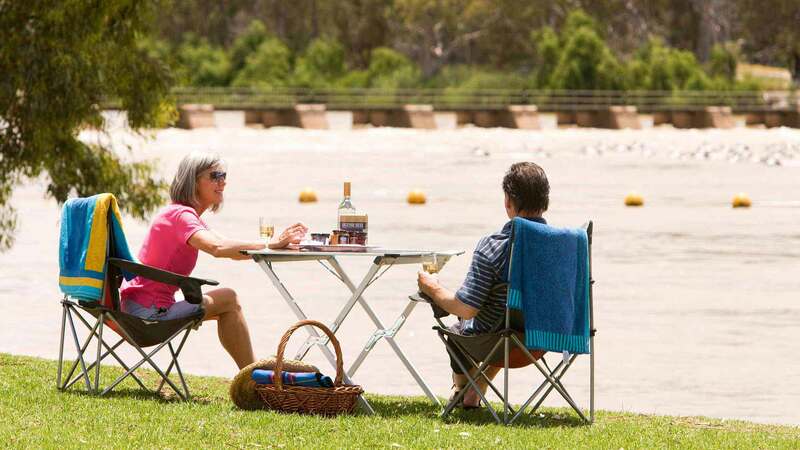 As you cross the Murray on the Sturt Highway, amaze at the breadth of the Murray River bordered by spectacular creamy limestone cliffs over 20 million years old – the perfect setting for a house boating holiday. The old bridge provides a superb viewing area for the fleets of pelicans gathered below the lock waiting for their catch. Sample some wine at Burk Salter Cellar door or hop on board their immaculately restored 1927 Chevrolet Truck for a private tour of the vineyard and adjoining wetland area. Visit Griffens Marina, now home to a range of luxury houseboats that in years gone by was a popular mooring spot for paddle steamers. The PS Pyap built in 1896 would regularly tie up at the riverbank to sell goods from further upstream. You can still see the word Pyap engraved on the old river redgum next to the hire boats at the marina. Blanchetown has some fantastic riverfront holiday homes for hire and River Shack Rentals manage some of the best!